SPRINGFIELD — The Illinois State Board of Education (ISBE) today announced the 28 school districts that are eligible to receive the Property Tax Relief Grant for fiscal year 2019. The $50 million state grant covers a portion of local property tax reductions, up to the statutory limit. A total of 373 districts applied for the Property Tax Relief Grant in this first year of implementation. The formula in the law awards eligibility to those districts with the highest unit equivalent tax rate compared to all the districts that applied. Eligible districts must submit an abatement resolution to their county clerks by March 30 and share the resolution with ISBE. ISBE will distribute the grant funding to each eligible district on a scheduled date after receiving the Certification of Abatement Form from the county clerk. The Property Tax Relief Grant amount will become a permanent part of each district’s Evidence-Based Funding (EBF) Base Funding Minimum going forward. The 28 eligible districts collectively may provide approximately $56.9 million in total local property tax relief, in exchange for the $50 million in state grants. ISBE will distribute any funds not used for the Property Tax Relief Grant through the EBF tiers near the end of FY 2019. The EBF law requires an appropriation of at least $350 million annually, with $50 million reserved for the Property Tax Relief Grant. All districts may apply for the grant each year, pending appropriations. 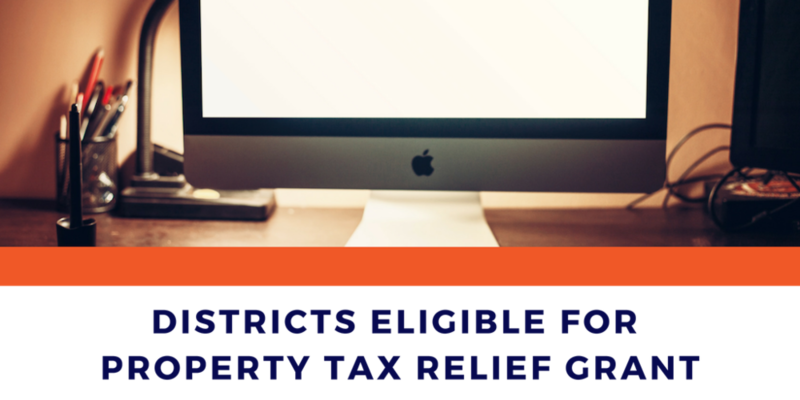 Find more information on the Property Tax Relief Grant and each eligible district’s total possible property tax relief at www.isbe.net/proptaxrelief.